Situated in the quiet and picturesque village of Winterton on Sea, Compass Cottage is detached and has been refurbished to a very high standard including a luxury fitted kitchen, with double and twin bedrooms. Only ten minutes walk to the sandy beach (with children and buckets and spades), shop, fish and chips and local pub nearby (families & dogs welcome). Close to broadland villages offering boat hire or Hemsby and Great Yarmouth for more lively entertainment for all the family. Compass Cottage & its sister cottages, Admiral Cottage and Beachside Cottage are all in the heart of Winterton on Sea old village and are within a short walk of the beach, pub & shop. Set in the heart of the Norfolk Broads, Winterton on Sea offers a base to explore wildlife, is ideal for cyclists and walkers, and is well situated for visits to many historical sites including National Trust and privately owned estates. There is also a wealth of family entertainment in the surrounding areas including theme parks, outdoor activity centres, steam trains and country parks as well as many things to see and do inside as well as out. 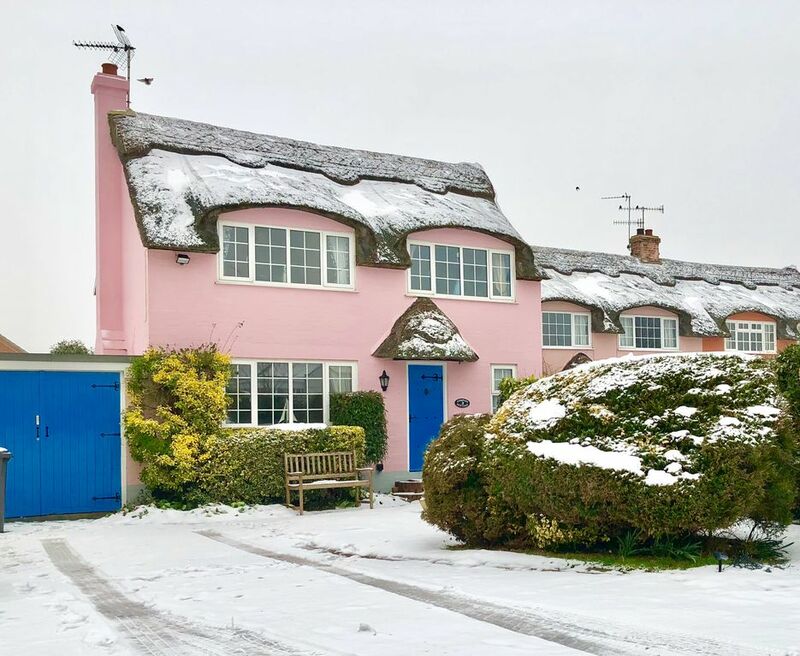 A pretty thatched detached cottage comprising hallway, living room with 2 large sofa's, dining room, kitchen, conservatory, bathroom with electric shower over bath. Upstairs are two bedrooms – master with king size bed and freeview colour television and twin bedded room with en-suite Shower room and freeview colour smart television. Services include oil-fired central heating all year, double glazing, bedding, bed linen, duvets, bath robes and fluffy white bath sheets are provided. Parking for two cars on drive (note - no access to the garage for guests). Electric cooker with ceramic hob and extractor fan. Washing machine/ tumble dryer combi, dishwasher, fridge freezer, microwave. Televisions - 46'' SMART TV in lounge, Digital TV also in both bedrooms, DVD player (with selected DVD's), CD player/radio, WIFI, hairdryer. Secluded garden with furniture. Selection of toys and games, high chair, cot & stairgate. Welcome pack on arrival. Pets welcome at no extra charge, no smoking. Winterton on Sea is ideally placed to explore the Norfolk coastline with its quiet sandy beaches, picturesque villages, bird sanctuaries and nature reserves. Nature lovers will find the Norfolk Broads a great attraction, as will walkers and cyclists. Above all, Winterton provides an opportunity to get away from it all as its beaches and tranquillity are what make it so special. Compass Cottage lies in the heart of the village and is nearby the local pub, The Fisherman’s Return, a 300 year old establishment offering local ales, good food and facilities for families, including a large safe garden. Historic Norwich lies 20 miles to the West with its fine cathedral, ancient cobbled streets and great shops. Only 25 miles north is the North Norfolk Coast and the well known towns of Cromer, Sheringham and Wells next the Sea and ten miles south lies Great Yarmouth for family entertainment, amusements and all that is traditional for a lively English seaside resort. En suite Shower room to twin bedded room on first floor. Family bathroom on ground floor (Bath with electric shower over). Pets are welcome and the rear garden is fully enclosed. We ask that pets are not allowed on furniture or upsatirs and are not left alone in the cottage. There is no extra charge for pets. The area around Winterton provides a great variety of different activities to suit different tastes. From coarse fishing, sailing, golf, birdwatching, horseriding and walking for those seeking outdoor pursuits, to National Trust properties and historic Norwich or family entertainment, theatres, horse racing, grayhound race track, fun fairs and amusements in Great Yarmouth (ten miles south).